"The Wall Personal Checks" product is already in your cart. You can buy beautifully designed and personalized textured checks. It is reasonably priced and besides serving the common interest of making transaction and paying out the requisite amount to the client and customer, you can make it appealing to others. 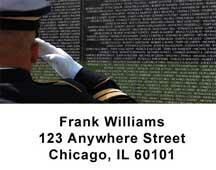 The wall personal checks have incorporated an inspirational image of the Vietnam Wall. It show off nationalism and sacrifices for the people who want a reminiscent figure of patriotic fervor on their profile. You can use them personally as well as for your company contract deals. Based on the price that you pay the benefits that you enjoy are unsurpassable.